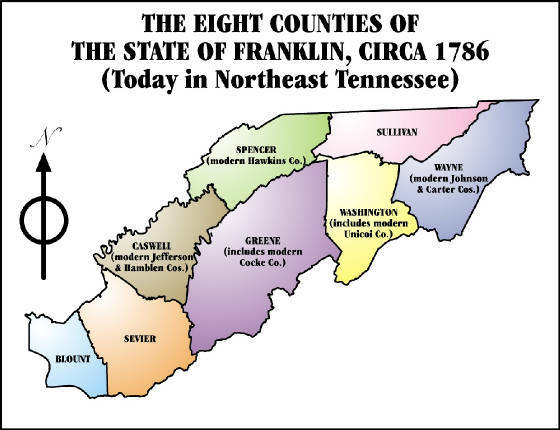 State of Franklin, named in honor of Benjamin Franklin, was a government (1784-88) formed by the inhabitants of Washington, Sullivan, and Greene counties in present-day East Tennessee after North Carolina ceded (June 1784) its western lands to the United States. Following preliminary conventions at Jonesboro in August and December of 1784, the first assembly meeting at Greeneville early in 1785 elected John Sevier as governor for a three-year term, established courts, appointed magistrates, levied taxes, and enacted laws. A permanent constitution was adopted in November 1785. Unable to secure congressional recognition and pressed by North Carolina in its attempt to reestablish jurisdiction in December 1784, North Carolina repealed the act ceding the lands. Sevier's government ceased to exist when the terms of its officers expired. The region reverted temporarily to North Carolina. Interesting fact: Although a short lived state, one notable figure was born in the State of Franklin--David (Davy) Crockett. Sources: S. C. Williams, History of the Lost State of Franklin (rev. ed. 1933); The Columbia Encyclopedia, Sixth Edition, 2007; U.S. State Department. For four years the Franklin government functioned under its own laws, courts, and elected officials. Simultaneously, North Carolina continued to claim sovereignty over the region, enforcing the claim with its own laws, courts, and officials. Quoting extensively from primary and secondary sources, Williams objectively explores the men and the politics that shaped and destroyed Franklin. Biographical sketches of instrumental leaders from both sides arid a comprehensive index make this book a valuable research tool.